Born in Lurgan, Co. Armagh in 1944, she studied at the Belfast College of Art. 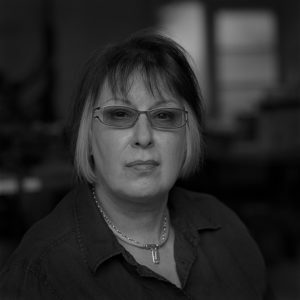 She has completed major sculptural commissions for institutions across Ireland and Northern Ireland, including St. MacNissi’s Church, Magherahoney, Co. Antrim (1966); the Arts Council of Northern Ireland (1975); the Church of the Resurrection, Cavehill, Belfast (1982); New Ireland Assurance, Dublin (1986); Dublin Sculpture Symposium (1988); Jefferson Smurfit Group, Dublin (1989); and Irish Life, Dublin (1992). Her 1996 portrait of Sir Alfred Chester Beatty is on display at the Chester Beatty Library, and her portrait of President Mary McAleese for the Office of Public Works was completed in 2003. She has held solo exhibitions at Jorgensen Fine Art, Dublin (1995) and the Irish Department of Foreign Affairs in Brussels (1996). In 2000, she held a shared show with Basil Blackshaw at the Pepper Canister Gallery, Dublin. Works include a lifesize bronze sculpture for the famine memorial graveyard in Clones, Co. Monaghan (1998); Group, a private commission of three eight-foot-tall bronze figures (2002); and Man with Kite, a large bronze panel for the new Customs House in Dublin (2003). She won the Irish-American Cultural Institute’s O’Malley Award in 1992.